Jackie Go is a hands-on mom to two young kids and a homemaker. She is also behind the popular lifestyle blog “Go Jackie Go” and is a part-time tv commercial and print model. She aims to inspire woken that looking good doesn’t have to be expensive and that being a mom is not an excuse to not to prettify one’s self. Thank you for including me to be one of your Glossy girls. To be honest, I was at first apprehensive because I don’t really have much to show. I’m very basic when it comes to taking care of myself. I’m a water-soap kind of girl. It wasn’t until I gave birth to my first child that I realized my body, particularly skin can drastically change and that I have to properly take care of it. 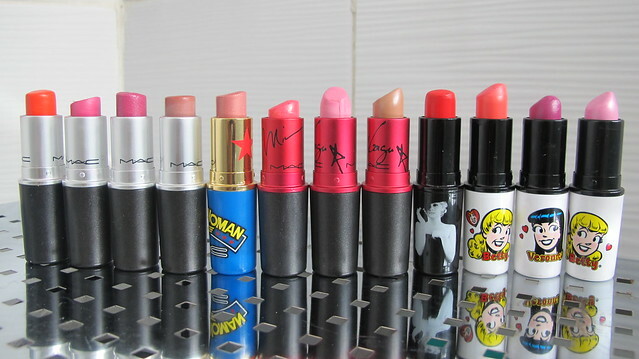 I’m a make up kind of girl kasi. I have a make up trunk filled with well, make ups. And have learned to wear them since I was in my early teenage years (I had to because of work) and skin care really wasn’t of interest to me until recently. I have to say I am lucky because I have a combination skin (dry and oily) so it’s a bit of a low maintenance thus, I didn’t bother having a skin care regimen. I am still in the process of learning what products work for me. 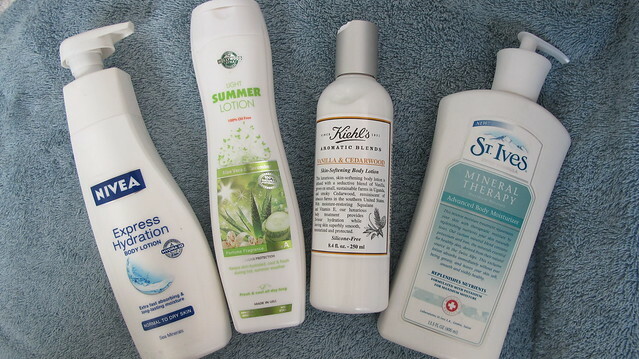 Anyway, for now, here are some of the products that I have tried and tested. My skin regimen is very basic: cleanse and moisturize. But I’ve added toning recently. 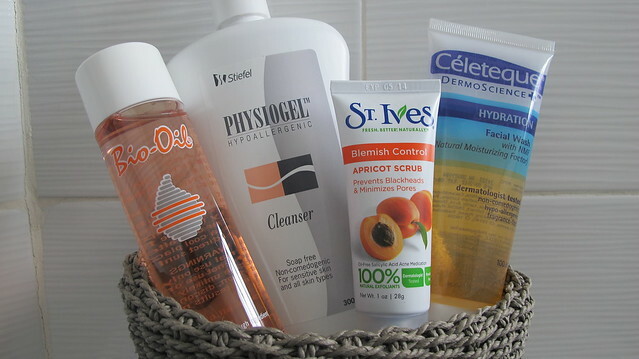 Here are my tried and tested products all of which I used even during my two pregnancies. I’m a late bloomer when it comes to skin care. Luckily, there are a lot of online sites that offer sample size products where women can try and test before actually purchasing the regular size. 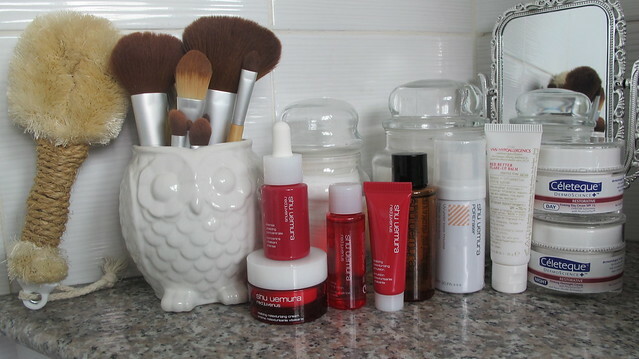 I got this Shu Uemura red:juvenus from Taste Central and as of writing I’m still trying them. So far so good! If I see good results by the time I’m halfway done, I’d buy their regular size. The Shu Uemura cleansing oil works for me too but I find it a tad bit too pricey compared to Bio Oil. Tin Dychiao gave VMV Red Better Flare Up Balm, I used it on my breakouts and it worked. The Celeteque DermoScience Restoritive Firming Day & Night cream are currently my staple skin care products and so far I like them, as they are non-greasy but gives sufficient moisturization. On the leftmost is my dry brush that I got for P88 at Saizen. I use it every other day before I shower to exfoliate my skin, preventing and reducing cellulite. My Eco Tools (they’re soft on skin, cheap and Eco-friendly too) make up brushes are placed inside my ceramic owl container from L’Indochine. I love anything that gives off a “bagong ligo” scent. Not to mention a supple, not so squeaky-clean feeling after every bath. 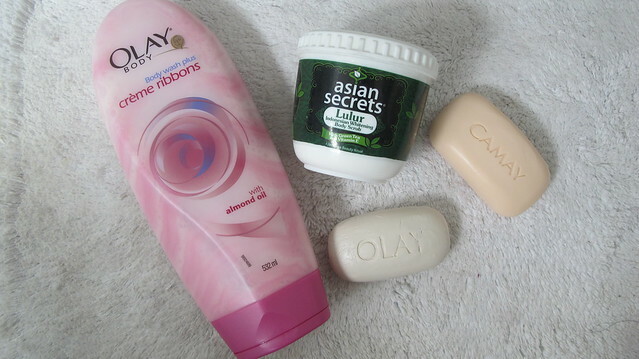 So I love Olay crème ribbons body wash, Olay bar soap and Camay bar soap and body wash (not in photo). As for body scrub, I recently discovered Asian Secrets. OMG. I love it. The scrub is a bit fine but surprisingly can exfoliate well. I like trying on different shampoos, I alternate them at least every two days so that my hair doesn’t get immune to it (at least that’s my theory). Since I have dry, falling hair (I blame my hormones) I’m keen on using anti-hairfall and hair thicken/strengthening products. 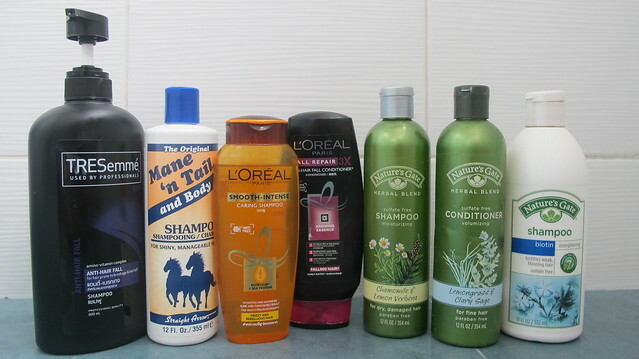 l-r: TRESemmé Anti-Hairfall shampoo, The Original Mane ‘n Tail shampoo, L’Oreal Smooth-Intense, L’Oreal Hairfall Repair Conditioner, Nature’s Gate Chamomile & Lemon Verbena shampoo, Nature’s Gate Lemongrass & Clary Sage conditioner, Nature’s Gate Biotin shampoo. Since I have dry skin, lotions have somewhat became an obsession for me. There are tons of lotions and body moisturizers in the market but only a few can really give that moisture without leaving a sticky feeling. 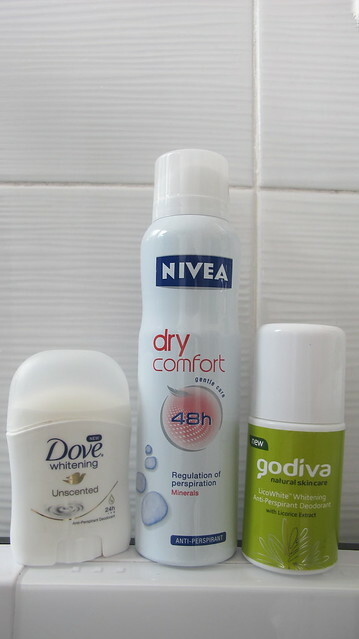 l-r: Nivea Express Hydration body lotion (one of the best lotions I’ve tried), Hollywood Light Summer Lotion (that cucumber scent smells clean and fresh), Kiehl’s Vanilla & Cedarwood Lotion (not only hydrates the skin but makes it supple), St. Ives Mineral Therapy. I also use Aveeno but I wasn’t able to include in the photo. I have openly said on my blog that my pregnancy with my first child gave me dark underarms. Yes, T.O. talaga. It didn’t lighten immediately after I gave birth. I even underwent underarm whitening treatments. Luckily, I found the perfect deodorants that worked for me. All three are effective and aren’t at all expensive. I believe (yes beauty queen ang peg) that every woman must look effortlessly beautiful, but sometimes it takes a lil’ bit of effort to achieve just that. Here’s my make up essentials which I use almost everyday. 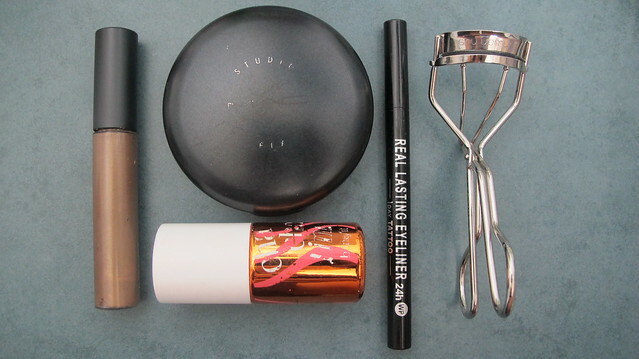 MAC Brow Set in Beguile, MAC Studio FX, K-Palette Eyeliner, Shu Uemura eyelash curler, Benefit Cha-cha tint. A girl should never go out without properly shaped and groomed eyebrows and curled lashes (especially if you have long lashes, no need to put mascara), eyeliner to define your eyes, a lip and cheek tint that compliments your skin tone top of with your chosen face powder to conceal blemishes for that perfect effortless look. Since I’m leaning towards morena, I love Benefit’s Cha-cha tint because of its orange tone. It instantly gives a glowy, dewy look on my skin making it more natural look compared to the red or pink tones. I like a lot of scents and each one reminds me of moments or events in my life. I am forever in love with Elizabeth Arden Green Tea. I actually want to collect the different variants. 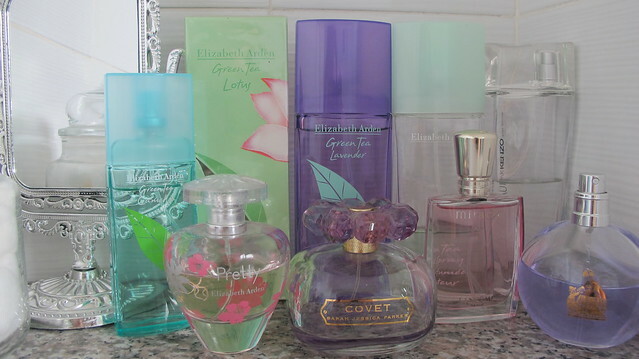 Currently these are my favorites, (clockwise) Elizabeth Arden Green Tea Camellia, Elizabeth Arden Green Tea Lotus, Elizabeth Arden Green Tea Lavender, Elizabeth Arden Green Tea, Kenzo Leau Par, Lanvin Eclat, Lancome Miracle, Sarah Jessica Parker Covet, and Elizabeth Arden Pretty. Subscribe to comments with RSS or TrackBack to 'Glossy features Jackie Go'.